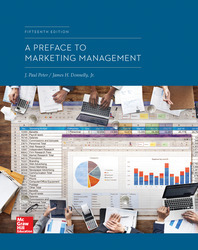 Praised in the market for its clear and concise presentation of the basic principles of marketing, the 15th edition, Preface to Marketing Management, continues to be engaging, clear, and conceptually sound. The 15th edition serves as an overview for critical issues in marketing management, Its brief, inexpensive paperback format makes it a perfect fit for instructors who assign cases, readings, simulations, or offer modules on marketing management for MBA students. Preface to marketing management also works in courses that implement a cross-functional curriculum where the students are required to purchase several texts.